Ask Yvette – How far can you go back? One question that pops up regularly in conversations is how far back we can trace our Dutch ancestors. Here’s a rough overview that will apply to most people. Research in the 1900s and 2000s is difficult because of privacy restrictions. You will need permission or proof of death to access records of people born less than 100 years ago. Since 1811, the entire population has been recorded in the civil registration. Anybody who died in the Netherlands after 1811 should be in it. Using the civil registration records in combination with other records such as population registers, notarial records, and court records should allow you to trace your ancestors back to the mid to late 1700s. Exceptions are children who are born out of wedlock or adoptees. Before 1811, church records are the most important source of vital information. These usually go back to the 1600s or even the late 1500s. Using church records in combination with notarial, court, and town records should allow you to trace most of your Dutch lines back to the 1600s. A notable exception are Jewish families, who often leave fewer records. Before say 1600, whether you will able to find any records about your family depends on their status and location. Wealthy people (property owners, business people, people enfiefed with property, nobles) leave more records. Or maybe your ancestors were serfs in the eastern part of Gelderland or Overijssel, like mine. I’ve found amazing serf registers that allowed me to trace some of my serf lines back to the late 1400s. Some places have court and town records going back to the 1400s or earlier, while for some places the early 1600s is when most records start. In my experience, when using records from before 1600, you may find the name you’re researching, but the records often don’t provide enough detail to prove relationships. Tracing property and relatives is often necessary to build a case using indirect evidence. 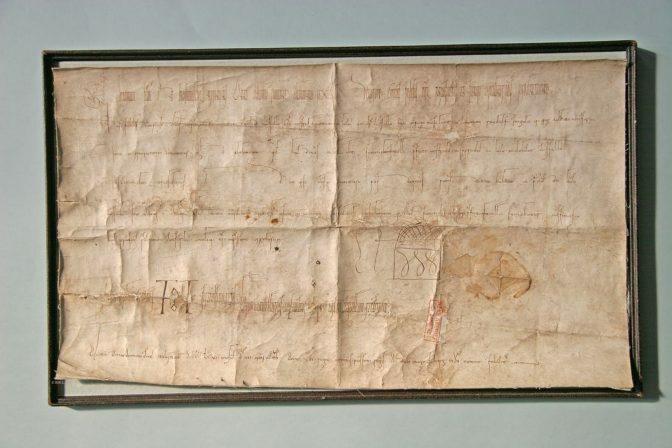 The oldest archival record in the country dates to 950 AD, when the German King Otto I donated rights in Kessel and Echt [now in the province of Limburg] to his vassal Ansfried. The record is kept in the series of the Thorn Abbey at the Regionaal Historisch Centrum Limburg. So in general, most lines can be traced back to the 1600s, but before that it all depends on the specific circumstances. See the types of dead ends in Dutch trees for examples of how far you can go. For examples of proving relationships in different periods, please follow my series about my possible line back to Eleanor of Aquitaine. Do you have a question about Dutch Genealogy research that is of interest to others? Please leave a comment and I may answer it in a future blog post. Hello, Yvette. You mentioned having serfs for ancestors. I read that members of the Frisii tribe became serfs during the Roman times. I also read that the poorest of people in the far north (Friesland/Groningen) were pretty much always free. Can you comment?